A client contacted THE LAB at Ambrell with a new process that involved heating a Kovar ferrule for a glass soldering application. Goals for the heating process involved speed, but above all quality and consistency. The client sent in the parts and took advantage of THE LAB's complimentary applications testing process. Initial tests were conducted to optimize the power delivered to the part. 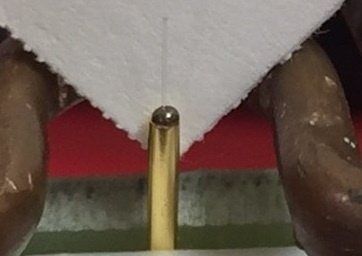 The ferrule was clamped between two non-conducting surfaces. The solder preform was placed over the glass fiber to rest on the end of the ferrule farthest from the side opening. It took nine seconds for the part to heat to 428 ºF (220 ºC). An EASYHEATTM 2.4 kW/150-400 kHz induction soldering system was used for the application with an open C-shaped coil. The EASYHEAT's modest required footprint along with the speed and repeatability of the application made it a success for the client.